Young children will know to Yell and Tell if they find themselves observing a dangerous situation. Children when taught at a young age to be proactive may carry this attitude throughout their lives. Jean Davidson is the founder and executive director. Jean founded the Yell and Tell Foundation in 2006 after her grandson, Ryder, died in a water accident that might have been prevented if the older child who saw the 4 year olds fall into the water, would have immediately yelled for HELP and told the closest person. He did what most children do. He was so scared that he ran so not to get into trouble for being down near the water. Jean is a long time educator who has written a lot of curriculum for schools. With police and fire departments, schools and hospitals urging her to turn this tragedy into a program that would teach children how to be proactive, Jean wrote the Yell and Tell program. It touches on the most dangerous situations that a child might be an observer to: River/Lakes, Pools, Poison, Fire, Guns, Child Enticement and Bullying. It is the only child safety program focusing on teaching the child who observes a dangerous situation what to do. Children who use Yell and Tell become Yell and Tell Heroes. There have been children from all over the country and world who have used Yell and Tell to alert an adult of a dangerous situation and in many cases saving a life. 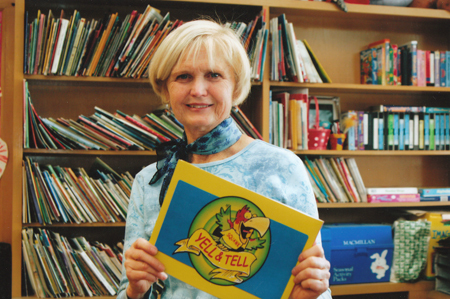 Jean travels continually sharing the Yell and Tell program with others around the world. Jean was named 2015 citizen of Milwaukee by the Kiwanis Club of Milwaukee for her dedication and passion in carrying the Yell and Tell message to children everywhere.